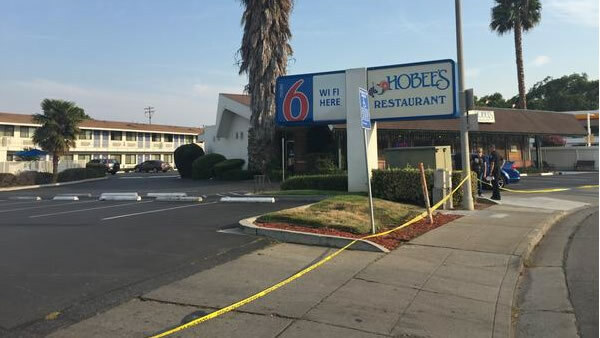 SUNNYVALE, Calif. (KGO) -- Sunnyvale police are investigating an officer-involved shooting that occurred in the parking lot of a Motel 6 near Highway 101 Saturday afternoon. Police say one suspect is dead and they are still searching for a second suspect who is considered armed and dangerous. Ongoing Police Activity - 1 firearm has been recovered. 1 suspect still outstanding believed to be armed and dangerous. Ongoing Police Activity - the recovered firearm was a handgun and it was located next to the deceased suspect. Police said a handgun was recovered by the suspect's body. Officers are searching for an African American man wearing blue jeans and a red and orange shirt. The man was last seen near the intersection of Borregas Avenue. It is unclear what led up to the shooting.